Swirlz Cupcakes = super tasty! Try them in Chicago (pictured above). Best breakfast baked goods in New Hampshire? Thank god! Now, your sugar can be caffeinated, too. The state of the retail baking industry? So-so, says this article. Six new dessert trends, in Columbus. Pineapple muffins? Sounds yum to me. A regional specialty in Oklahoma: Aunt Bill's Brown Candy! Twinkies return to production..what does it mean for a small town? Warm and gooey deep dish chocolate chip cookies. No part of that is wrong. Need a graduation cake idea? Dessert trends on the rise: dacquoise and fig cookies. Huh! Selfies with pop-tarts. My new favorite thing. 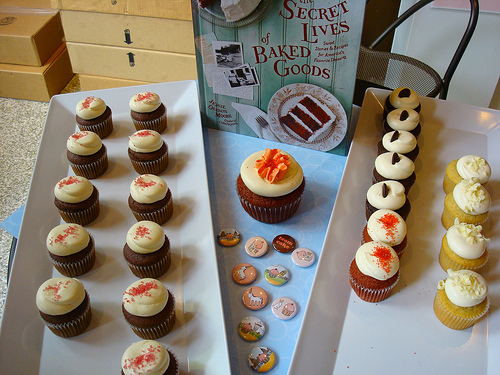 Don't forget to enter this totally sweet contest: share the secret life of YOUR favorite baked good!